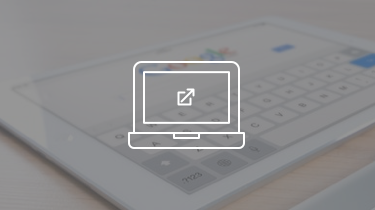 We’ve done a ton of content on SEO — on search engine optimization — over the years. That’s actually one of the things that we’re known for here at Carrot. A lot of our clients own and control search engine rankings all across the country for all kinds of phrases, but one of the questions we get a lot that we’ve never answered before is, how do you choose between a couple different SEO providers, and specifically, what are they doing to build their backlinks? And what should you avoid? This particular video is going to talk about something called a private blog network, or PBN for short. If you’re out there hiring an SEO firm, one thing you want to really look at is how are they building their backlinks because that’s one of the biggest, most important parts of what they’re doing and what it is you should look at. If they’re going to be building backlinks, are they going out there and organically building them? Are they onesie, two-sie, hands-on building them, or are they using something called a private blog network? Is that a good thing or is that a bad thing? I’m going to walk you through what it is really quick, and what to avoid, and what to look for, and why you could be taking a risk if you go with an SEO firm that uses SEO private blog networks. What Are SEO Private Blog Networks? What a private blog network essentially is, is some really, really smart people found out that you can go buy expiring domain names in the real estate market or wherever. You can buy expiring domain names for really, really cheap where people have built up the SEO juice on those domain names, a very fancy term there, SEO juice, on those domain names over the years and it might have a domain authority of three, or four, or five, or something like that. It comes with backlinks. It comes with juice, and they buy those up. Then they buy up a series of them, and they put on very simple websites and put on content. Then they use those websites to then drive backlinks to your website, so backlinks are, of course, a really, really good thing when it comes to SEO. It’s one of the most important things after you nail the on-page stuff. The website needs to be structured in the correct way, but then you also need to build up these signals that Google’s going to be looking for. Are you getting some people to take action on Facebook likes and things like that? Your citation profile, are you listed on Yelp, and Yellow Pages, and Manta, and local places that list your business? Is your phone number in all those the same? Do they match? Then backlinks, if you’re in a competitive market, you’ve got to get backlinks to get higher. With a private blog network, it’s really attractive because when you go with an SEO firm that uses PBNs to build links, whether they tell you or not — many of them won’t tell you — oftentimes the price is going to be cheaper. You can get an SEO service from someone who is using a PBN for probably half the cost of someone who’s doing it the correct way. What happens is this. This is your website right here. Each one of these black squares is a separate website and they’re all linking to your website, but they are purchased websites from expiring domains. So is this a big deal? Why is that a bad thing? They’re linking to my website. It’s got content on it. Well, the issue is eventually they all tie back to that SEO firm in some way, shape, or form. Now the smart ones have figured out ways to really obfuscate whether Google can find if they own them. They found ways to register the domain names under different names, have hosting, a different host, which is all really smart stuff. 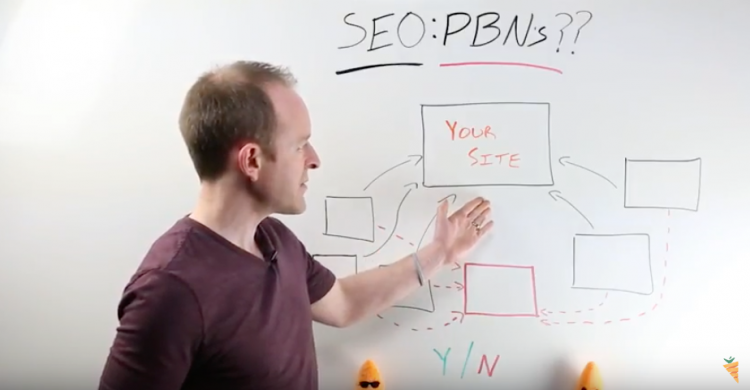 A PBN may never ever get discovered by Google, and that’s sweet because that’s going to be great for you on the link building side. But… if a PBN gets discovered, all those backlinks that you just paid for, all that SEO that you just paid for, those links are likely now going to get negated. What’s going to happen is if your SEO was built off of a PBN backlinking structure? That entire structure could topple and fall. Now, is that going to happen? The likelihood is probably under 50% for sure. You may go years, and years, and years with an amazing ranking, close a bunch of deals, get a bunch of leads, because of the PBN links that you got from the SEO firm, amazing. You have great ROI, but we never ever like to build anything off of a foundation that could crumble. Make sure when you’re building SEO when you’re hiring an SEO firm, that they’re going after it building backlinks the real way, the organic way, which is hard, which is expensive. That’s why you see the firms that are really good at SEO that charge a lot of money. If you’re going to hire an SEO firm that’s going to be $1,000 a month of under, the likelihood that they’re using private blog network links is probably pretty high. Where are you guys building your backlinks? Is it from a private blog network or are you guys going out there organically? Many of them won’t tell you the truth, but you can reach out to us at Carrot all the time. We’ll dig into some of their clients’ websites and we can track it back.. many times, not every time, but many times to see if they’re using a PBN. If it were me, I would definitely, if you had a choice it is, yes to use PBN for backlinks or no, I would always choose no. We’ve never used them ourselves. We suggest you don’t either. Once again, can it work? 100% yes, but we also go with a long-term mindset and model. 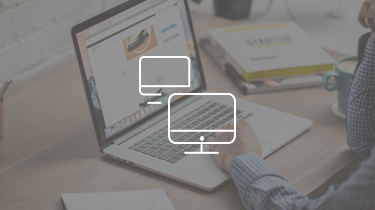 The next time you’re going out there talking to an SEO firm, find out their methods. Find out how they’re doing it. Talk to other clients. See other rankings, but look behind the curtain a little bit. Hey, it’s a good white hat thing. It’s very gray hat, and it’s not something that we suggest. It could get discovered and could topple because anytime you’re trying to gain SEO, Google doesn’t like the practice of using such tactics or techniques. All right, so until next time, go out there, and do SEO the right way, and hire the right firms. Don’t forget to check out our other Carrot whiteboard strategy sketches on our YouTube channel and our CarrotCast Podcast, which is our weekly podcast, as well. Great video. I like the exposure you bring to the white hat ways of doing SEO that benefit users over the long-term vs. the short term gimicks that only work short-term until Google figures it out and either removes the benefit or penalizes you for doing it. Keep up the great content! Thanks Michael! Glad you enjoyed it man! Ya, there’s tons of SEO services in real estate that are low cost and use PBNs and they don’t tell their clients they do… or the *potential* ramifications of that. 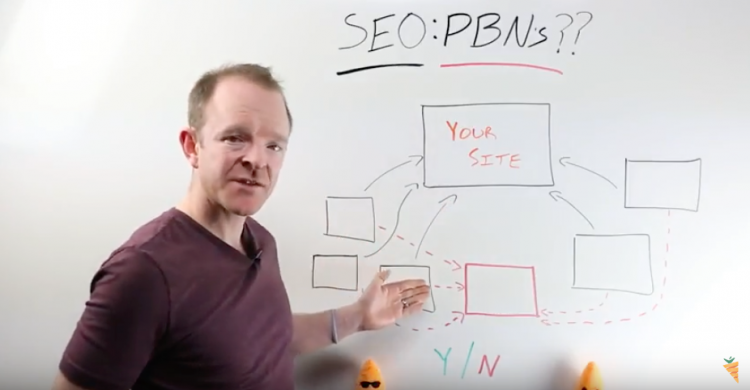 In the end… the PBN links may be amazing for years… may explode on them in months… you never know… but we do know it’s not in the spirit of what Google wants and that’s always a good indication that it shouldn’t be done that way if you’re after long-term solid results. There’s a service out of the UK that several big investors I know (even Carrot members) are using that is getting them great rankings… $1k/mo… very professional company… but researching their backlinks they’re clearly using PBN links. If I could sniff it out within 10 mins of research I feel it’s highly likely Google will eventually as well. Great videos and a fantastic walk through. I did a post on PBNs myself, and this is pretty good Trevor. I need to do a few videos myself. Should be coming up soon. 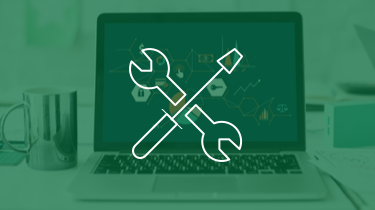 Are you building on Expired Domains or Auction Domains?